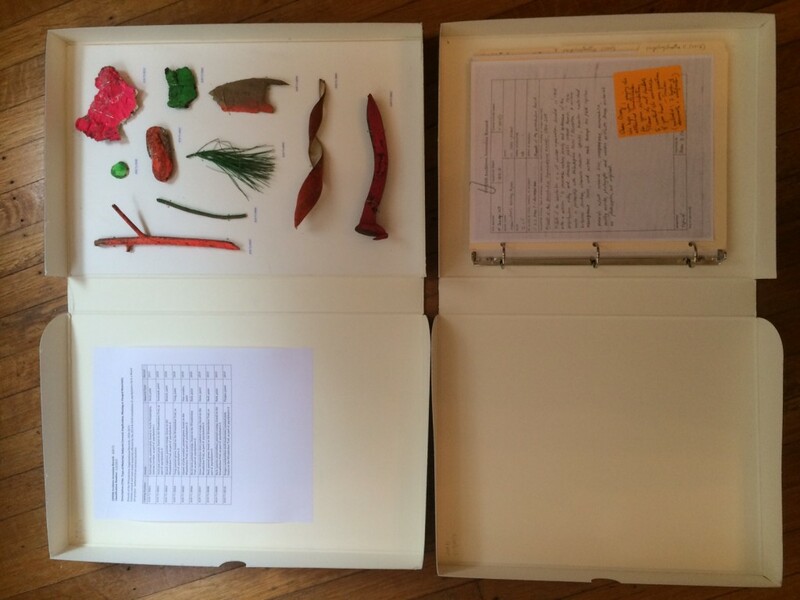 The Think Tank was recently invited to to participate in Imaginary Archive, an ongoing project organized by Gregory Scholette. The project is a collection of real and fictional printed materials documenting a future “whose past never arrived,” according to Scholette. This iteration will be presented as a part of an exhibition, “Traces in the Dark,” curated by Liz Park at the Institute of Contemporary Art at the University of Pennsylvania. The exhibition runs from February 4th to March 22nd. We hope you’ll take the trip to come see our contribution. Fast forward to 2018. The City of Philadelphia and particularly the local school district have (again) come under significant financial stress. As a strategy to create revenue, the city starts selling parcels of land in Fairmount Park. The Wissahickon Creek Trail soon comes under threat and the Mural Arts Program partners with several other city agencies to install psychylustro II in the park. The express goal of the project is to generate additional revenue for the park system through a series of exclusive tours and related touristic packages. The second iteration of the public art project involves spraying water-based paints on the banks of the creek and on some of the historic WPA-era structures that are in disrepair. 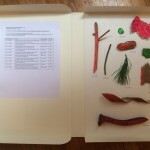 This collection is contained in the archives of the University of Pennsylvania and was donated by the Friends of the Wissahickon, an organization which for several decades has been the caretaker of the Wissahickon Creek and its trails. 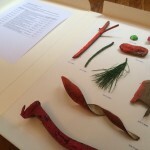 Objects included in the archive have been gathered from the sites of both the original psychylustro and subsequent psychylustro II. The documents include (real) history and correspondence surrounding the Mural Arts Program, from its early history as an anti-graffiti initiative up until the (fictional) 2018 installation of psychylustro II. 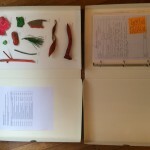 Here is some background on the Imaginary Archive project. 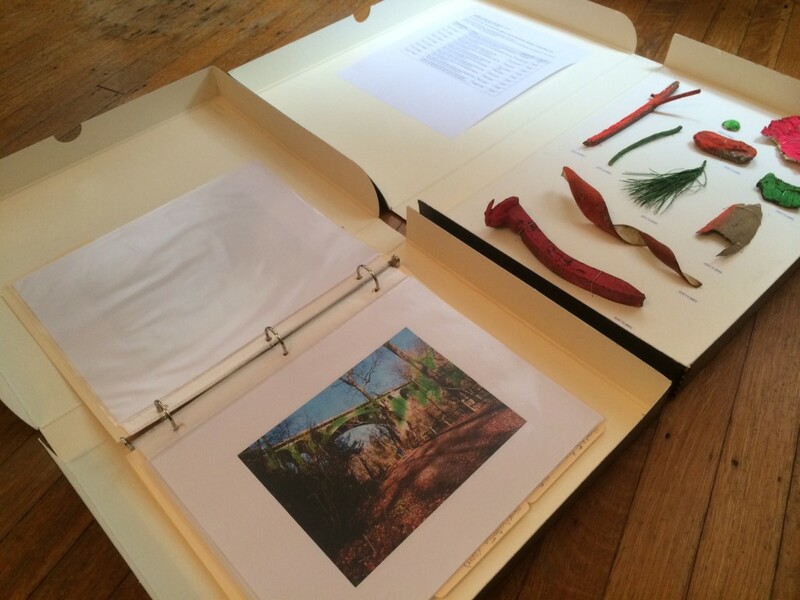 Past contributions to the archive can be viewed here. 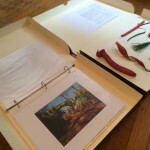 This entry was posted in Notes and tagged art, greg scholette, imaginary archive, mural arts program, philadelphia, public art on January 29, 2015 by admin. 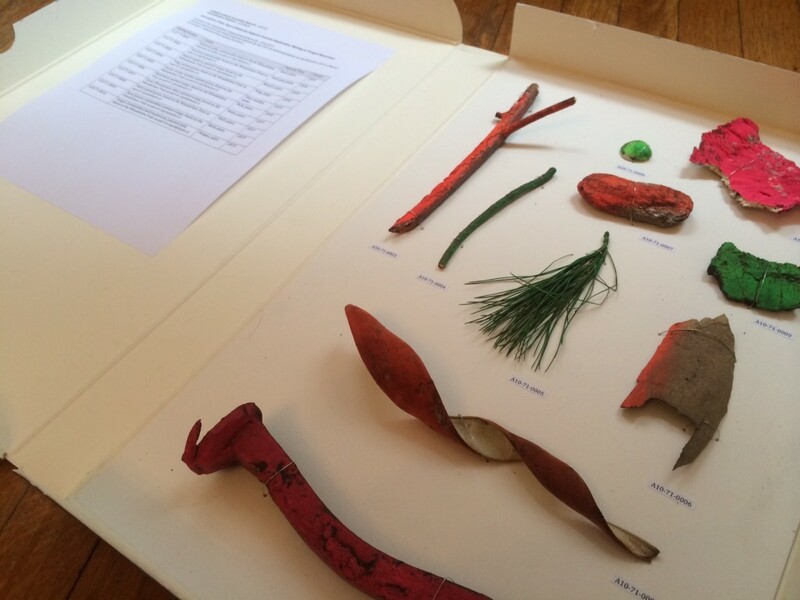 Structures of Support is an ongoing, multi-phase project begun in late 2012 by Jeremy Beaudry, Katie Hargrave, and Meredith Warner. 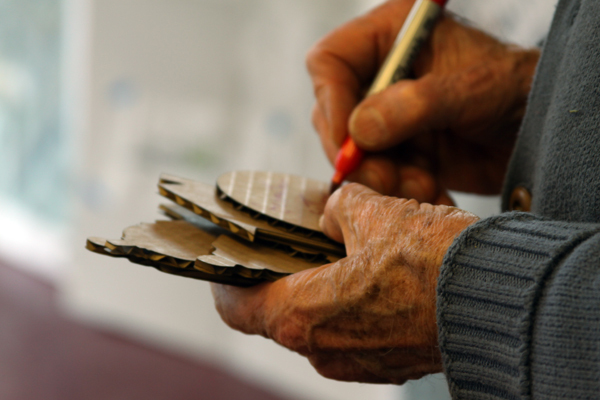 In this project we want to develop a clearer understanding of how our support structures are created and maintained, and how we might then work to build more resilient and robust support structures in the future. 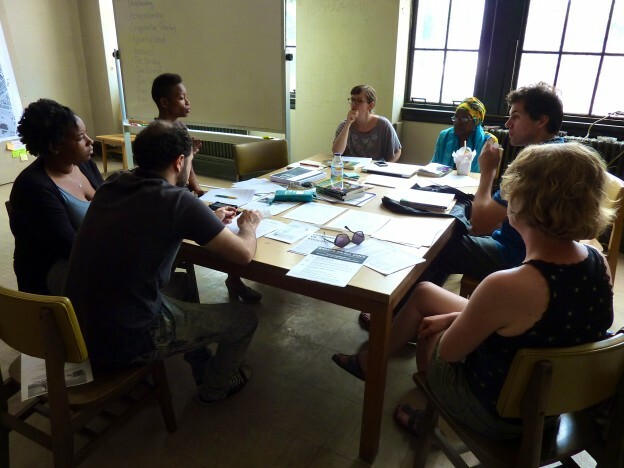 In the summer of 2013, The Think Tank that has yet to be named collaborated with artist Jacob Wick to transform a long-closed building known as Germantown Town Hall into a multipurpose public space we called Germantown City Hall. 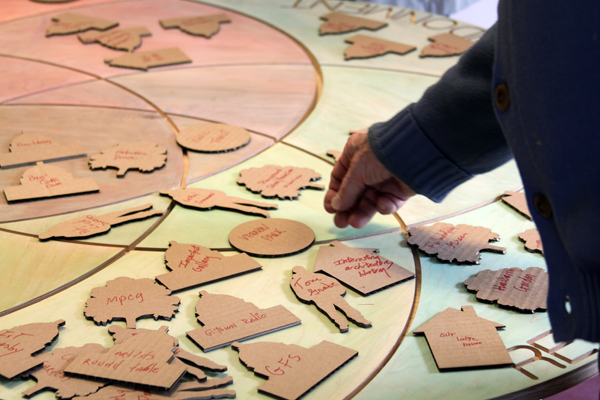 As a part of our ongoing project Structures of Support, we asked neighborhood residents to reflect on the meaning of civic space for the community. Below are the video recordings of a select number of those interviews. This entry was posted in Projects and tagged community, conversation, GCH, germantown, interview, philadelphia, structures_of_support, urbanism on January 19, 2014 by Jeremy. 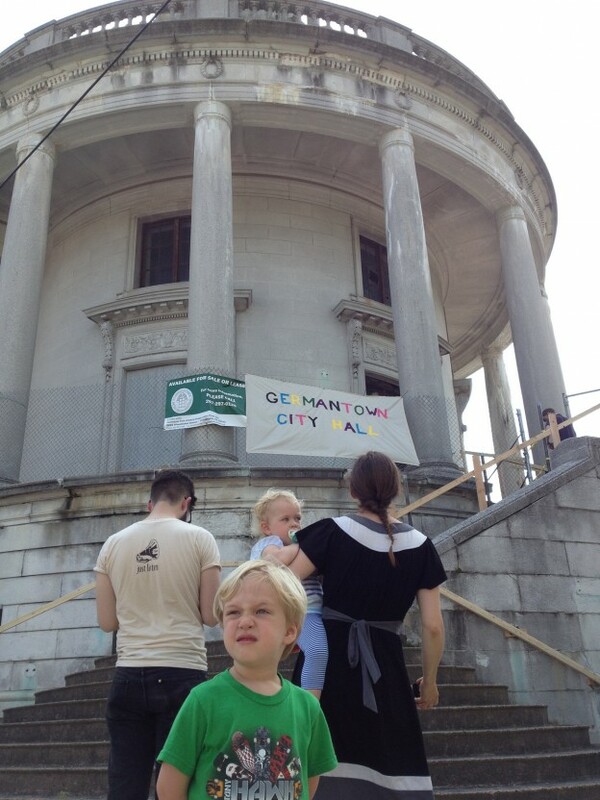 Jeremy Beaudry, Katie Hargrave, and Meredith Warner collaborated with Jacob Wick to create Germantown City Hall for the 2013 Hidden City Festival in Philadelphia. 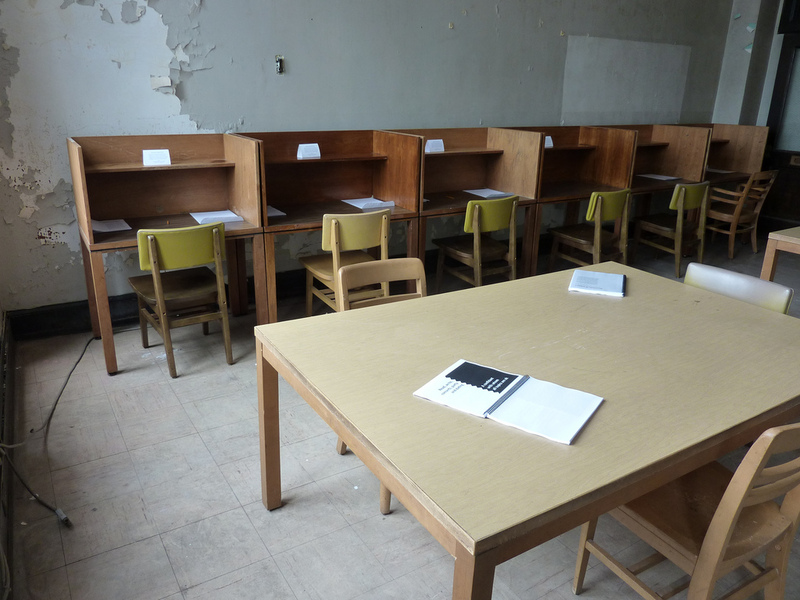 The project temporarily opened the neglected Germantown Town Hall building as a space for civic engagement and debate, with a meeting/performance space, reading room/lending library, and office/copy center. 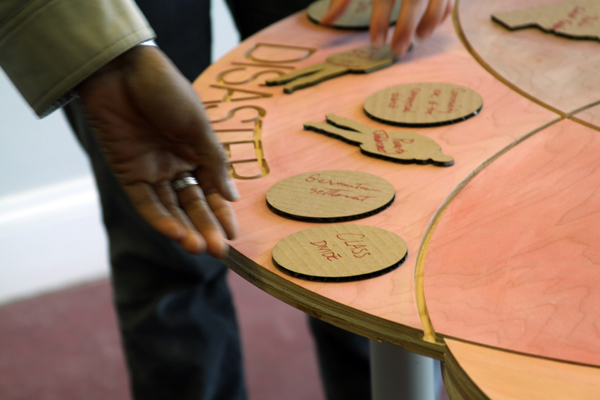 In June of 2013, The Think Tank had the opportunity to work with artist Jacob Wick on a project called Germantown City Hall. Together we transformed a long-shuttered building known as Germantown Town Hall into a multipurpose public space offering a performance and meeting area, a reading room/lending library, an office/copy center, and workshop room. 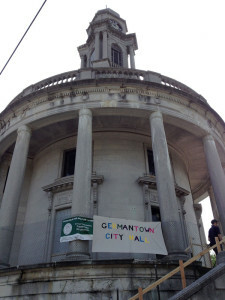 For six weeks, residents of Germantown had free access to City Hall and were invited to schedule meetings, performances, and events in the building. City Hall became, first and foremost, a civic space in which dialogues amongst and between the citizens of Germantown could occur. The opening of the town hall building to the community produced a number of outcomes which are still being felt and addressed beyond the timespan of the project. 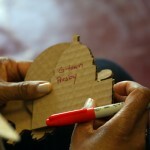 We were able to catalyze new relationships between people and organizations working across Germantown which has led to ongoing initiatives to keep the building open to the public, to manage the archive of Germantown residents’ history we collected, and to create a living database of neighborhood resources. Germantown City Hall worked as a prototype of a different kind of civic space in the neighborhood that wasn’t currently provided for, a space that was secular, non-governmental, open, and networked. The success of the space depended largely on the implementation of a clear, effective infrastructure which allowed for emergent uses, activities, and different levels of engagement. The use and life of the space grew slowly over time. The participatory structure was inclusive and accessible, and it was ad hoc, meaning that the space satisfied unmet, immediate needs within the community. Aside from co-designing the infrastructure of the space and community participation, one of our contributions to Germantown City Hall was to import our Structures of Support work into the space and customize it specifically for Germantown. Throughout the course of the project we collected data from the community, mapping past and current support networks and assets that might otherwise be invisible—things like informal civic groups, clubs, leisure groups, cooperatives, playgroups, town watches, community gardens, and so on. We made our Structures of Support Survey available to all visitors, which allowed us to understand individual conceptions of support within Germantown. 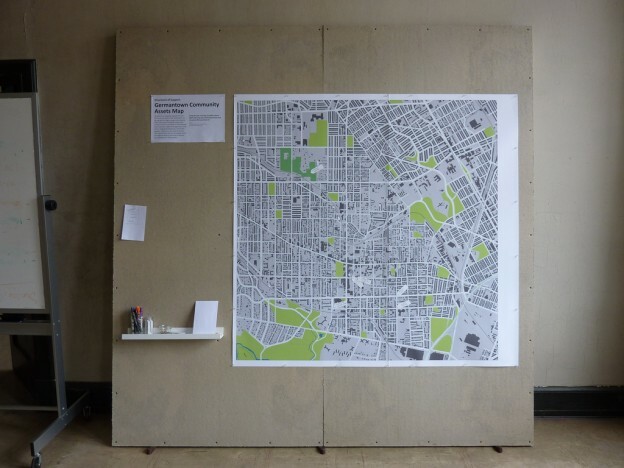 We also installed a large scale map of of the neighborhood and invited visitors to identify assets within Germantown. 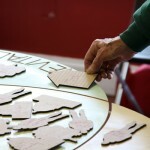 At the start of the GCH project we hosted a workshop to begin populating the map. 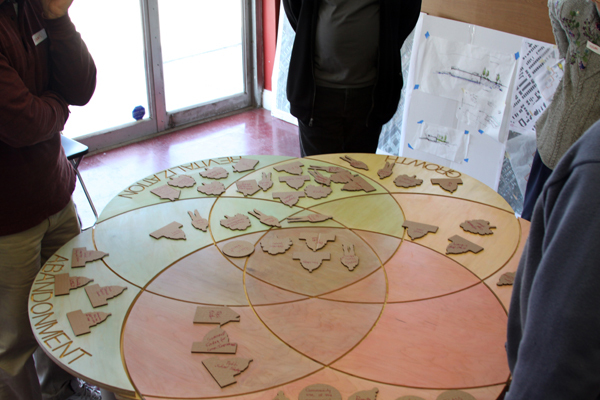 Over the course of the 6 weeks the map itself acted as a generative and convivial tool for conversation among neighborhood folks. It often became a focal point where strangers gathered to chat about what they know and query each other for knowledge about Germantown. Everyone engaged in impromptu storytelling about what is, what has been, and what could be. Through this process, we heard from the neighborhood how valuable the asset map could be as a living database of neighborhood resources, whether in a physical or digital format. We are in the process of digitizing the map and its data, and we hope to partner with other organizations to create a more sustained, growing, and widely available version of the asset map that began at Germantown City Hall. Additionally, we led flag making workshop with community members (kids included!) to create flags and symbols for Germantown, allowing folks to show their true colors, presenting issues and desires for Germantown through symbols rather than words. 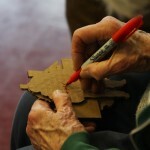 We hosted flag making workshops so that Germantowners could create flags for the neighborhood. 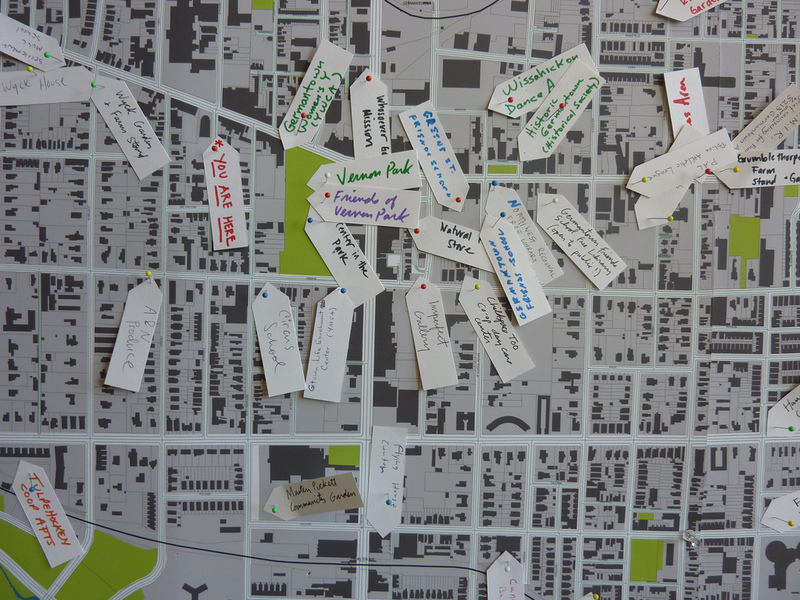 We hosted a community workshop to generate data for the Germantown Community Assets Map. Germantown City Hall was commissioned by Hidden City Philadelphia for the 2013 Hidden City Festival with the generous support of The Andy Warhol Foundation for the Visual Arts. This entry was posted in Projects and tagged community, germantown, philadelphia, structures_of_support, urbanism on July 2, 2013 by Meredith. The Think Tank will be facilitating a series of workshops and conversations as a part of Germantown City Hall, and the first of these will be held on Sunday, May 26, 1-3pm in the workshop room at the Town Hall. 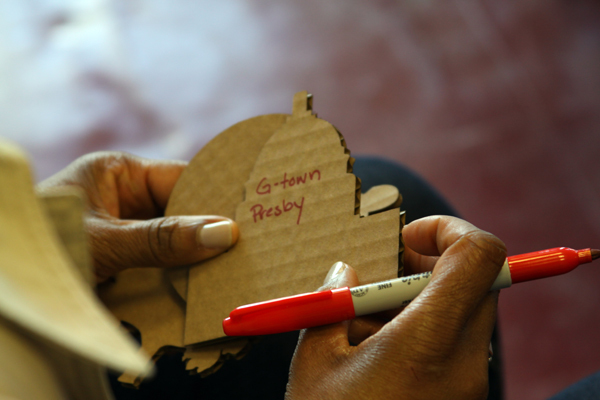 We are presenting aspects of Structures of Support in GCH and the goal of Sunday’s workshop will be to begin a large-scale physical map of the many wonderful assets and resources that are available in Germantown. Such resources might be community gardens, homegrown schools, artisans, informal co-ops, and on and on. 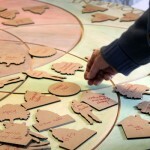 The map will also help us to visualize where we might be lacking resources so that we can collectively fill these needs. We’ve invite a number of community members with deep experience in the neighborhood who we believe will have important knowledge to contribute as we launch the mapping project. The community asset map will be on display for the duration of Germantown City Hall, and we will be inviting all visitors to add to the map throughout. This entry was posted in Notes and tagged community, conversation, GCH, germantown, philadelphia, structures_of_support, urbanism on May 24, 2013 by admin. Thursday saw the opening of Germantown City Hall, our collaboration with Jacob Wick and Information Department which is part of the 2013 Hidden City Festival. In this project, we are transforming a long-shuttered building known as Germantown Town Hall into a multipurpose public space offering a performance and meeting area, a reading room/lending library, an office/copy center, and workshop room. Residents of Germantown will have free access to City Hall and are invited to schedule meetings, performances, and events in the building. It is our hope that the City Hall become, first and foremost, a civic space in which dialogues amongst and between the citizens of Germantown may occur. As residents of Germantown, we are thrilled to be working on this project and making this space available to our neighbors. The people we have met over the last few months and the relationships we’ve created have been inspiring and humbling. 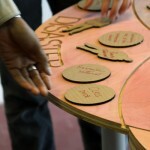 And we look forward to meeting so many more folks during the next six weeks that the project is open. To get involved, find out more, or share leads, please contact info@gtowncityhall.net or call us at 575-446-3676. Stop by Germantown City Hall and say hello. Visit the website and online calendar to learn more about the various events happening in the space or to schedule your own events. This entry was posted in Notes and tagged activism, art, community, conversation, germantown, philadelphia on May 24, 2013 by admin. Preparations are well underway at the Germantown Town Hall for the opening of Germantown City Hall, our collaboration with Jacob Wick and Information Department which is part of the 2013 Hidden City Festival. Last week, we had help from some amazing volunteers and Hidden City staff to begin cleaning the space and moving in donated furniture. As we begin to inhabit the space, the power and possibility suggested by the building becomes more and more clear. 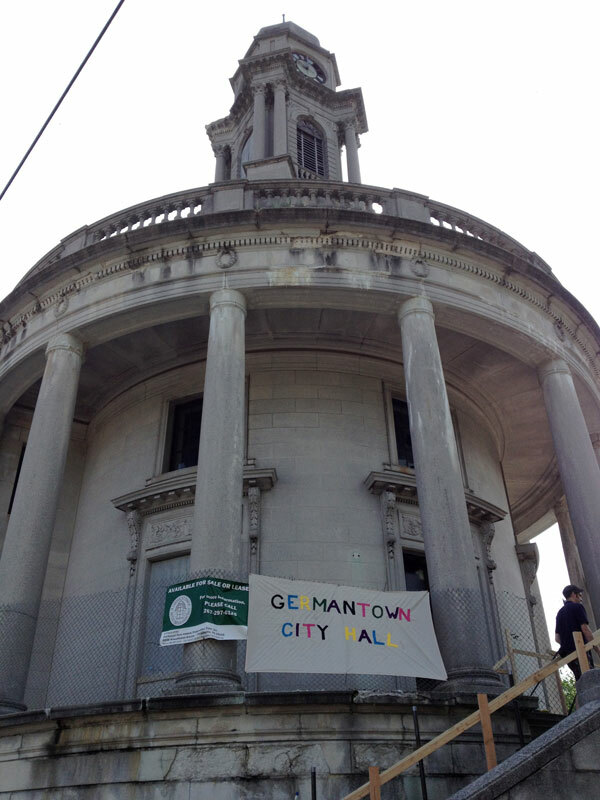 From May 23 – June 30, the Germantown Town Hall building will reopen as Germantown City Hall, a multipurpose public space offering a performance and meeting area, a reading room/lending library, an office/copy center, and workshop room. Residents of Germantown will have free access to City Hall and are invited to schedule meetings, performances, and events in the building. It is our hope that the City Hall become, first and foremost, a civic space in which dialogues amongst and between the citizens of Germantown may occur. To get involved, find out more, or share leads, please contact info@gtowncityhall.net or call us at 575-446-3676. This entry was posted in Notes and tagged art, community, GCH, germantown, philadelphia, urbanism on May 15, 2013 by admin. When I move through Philadelphia, much of what I observe and experience is filtered through the ideas expounded by the philosopher and social critic Ivan Illich. The connecting thread throughout his work is rather straightforward: Our industrial-scaled institutions and tools have overpowered us to such a totalizing degree that we are no longer able to disentangle ourselves from their colonizing effects. That is, schools and universities, governments and public agencies, and corporations of all kinds have greatly diminished our individual and collective capacity to provide for ourselves and each other. Another way to understand Illich is to describe a spectrum of connectedness to ourselves, each other, and the world. At one end of this spectrum is a set of relationships with the world that is convivial—amicable, human-scaled, life-supporting, present. At the other end is the impersonal and alienating mechanism of industrialization that amounts to a profound dehumanization. In Philadelphia, I see ample evidence of lives being lived at either end of this spectrum and at many points in between. On the side of conviviality are cooperative preschools, neighborhood food coops, time banks, and community gardens, while on the side of industrialization are coroporatized charter schools, welfare offices, fast “food” chain restaurants, and acres of vacant, fallow land cordoned off by the city. Illich invites us to combat the alienating forces of industrialization by reclaiming our capacity to support each other through meaningful interchange, to rely less on the dominant institutions of contemporary society, and to lean more on each other. This is a tall order to fill. His challenge is impossibly audacious. I suspect that, for many of us, we have never thought very deliberately about the kinds of support structures we do have or might need to live more fully with our communities. 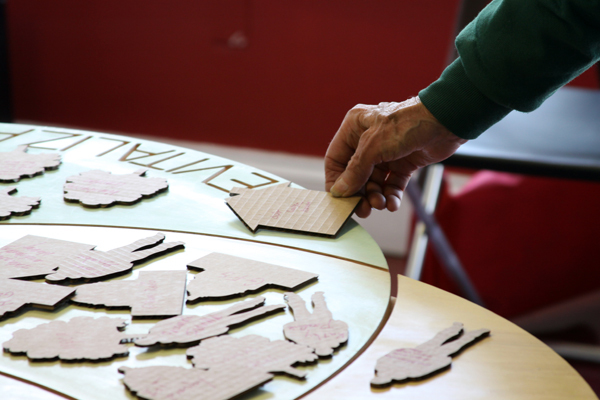 In the Think Tank that has yet to be named, one of our primary research interests is in exploring the structures of support that people create and maintain in order to live a life. By asking people about their support structures, we hope to learn how to build more resilient and robust support structures in the future. In part, I see this work as answering Illich’s call. 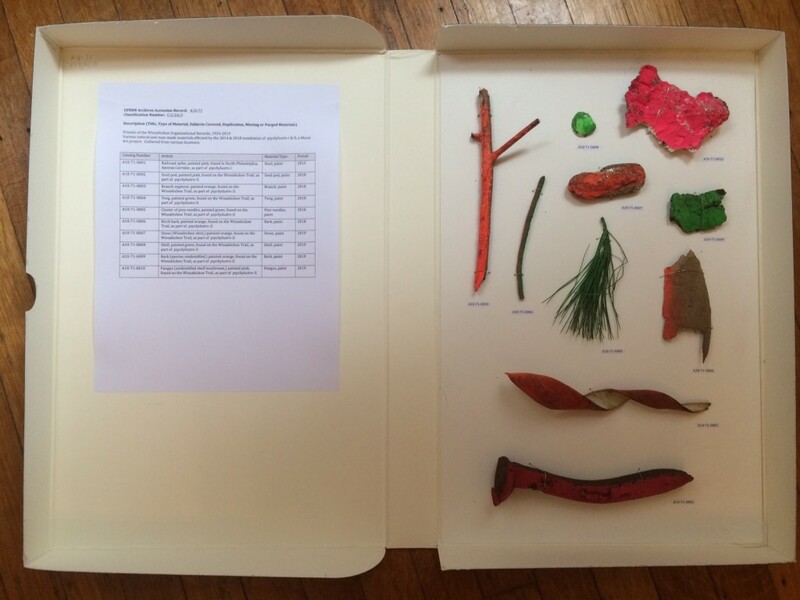 His oeuvre charts a trajectory away from industrial institutions and values toward the deschooling (de-institutionalization) of society, the creation of tools that support conviviality, and the reclaiming of values grounded in more communal ways of life. The trajectory of our research on the structures of support aligns precisely with these goals. At a basic level, examining the structures of support begins with this question: How is it that some get by so well, while others barely get by, or not at all? There is a political debate regarding this question that is rehearsed ad infinitum. Those on the left will push for more government social services and assistance (the state controlled social safety net), which necessitates the increasing institutionalization and bureaucratization of most aspects of life in the name of efficiency. On the right lies the counterargument that less government oversight and the selling off of public entities, services, and infrastructure to the private sector will somehow generate a just society (this coupled with the moralizing myth of bootstrapping and personal responsibility). It should be noted that whether public or private in nature, the sheer scale of the resulting public agencies, non-profit organizations, or multinational corporations is such that they all further the industrialization of daily life. This is a gross oversimplification, which should not be taken as flippant, because politics have very palpable consequences at the level of the neighborhood and the individual. But, in returning to the question posed at the outset of this paragraph, I believe that our attention and energy must be focused on understanding how individual citizens can live communally in our streets and blocks. With my partner (Think Tank collaborator, Meredith Warner) and two children, I live in a neighborhood called Germantown, which happens to be one of the oldest settlements in Philadelphia. Today, quaintly restored colonial buildings—George Washington’s summer home is here, Thomas Jefferson slept over there, the first abolitionists met just around the corner—are interspersed throughout a large and diverse urban district that runs the gamut in terms of racial, economic, and class constituencies. There is an omnipresent yet guarded historical quality to the neighborhood, locked away with few exceptions behind placards recounting the long past events that impart to it the official textbook history. Like most of Philadelphia, Germantown is “block to block”, which is a way we talk about the unevenness of the city with respect to degrees of safety, disinvestment, and abandonment as they materialize, often drastically, from one block to the next. We’ve lived here for nearly three years, and there is still so much we do not know about this place. We do not know the extent of its outer edges, its urban nooks, its quiet side streets, its vacant lots and abandoned buildings. We do, however, know our block, and those blocks surrounding ours. We know the various paths we routinely walk during the course of our regular and rhythmic movements within the neighborhood. These include: to and from the train station, to and from the library, to and from the drugstore, to and from the park, to and from the community garden. We walk often in the evenings with our kids, in a final push to drain their endless energy. We walk “the loop”, as it is known to us, and we anticipate the things that we’ll meet along the way—the houses of people we know, the long wall the kids walk on, the empty parking lot they run screaming circles in, the front porch with the old, tired cats, the cactus in the sidewalk where more than once they’ve caught stickers in their tiny fingers. Some evenings, our loop is detoured by a stroll along the “secret alley”, so called because it is an overgrown, infrequently travelled street that runs along the backside of large urban residential lots filled with formative old houses topped by rusty weathervanes and patchworks of slate and asphalt roofs. Less frequently, we venture further outside of this radius—a range established by the maximum capacity of little legs with limited patience—to explore unfamiliar territory, much of it dotted by the string of colonial-era historic sites and houses that partly give Germantown its distinct character: Wyck, Grumblethorpe, Germantown Friends, Johnson House and others. But this is a living city, and so along the way we find the spaces that give a place texture: commercial corridors, neat brick rowhouses, grand stone twins, churches of all denominations and sizes, ancient graveyards, well-used and disused parks, faded storefronts, crumbling warehouses, vacant lots. This is a living neighborhood, a working neighborhood, a struggling neighborhood filled with people doing all of the things that people do: waiting for buses, waving hellos to friends and neighbors, buying lottery tickets and newspapers at the kiosks, smoking, idling on corners, visiting libraries, worshipping in churches, sleeping on park benches, hustling passersby, waiting in lines, drinking coffee, yelling and laughing, getting by and not getting by. So, how is that some get by so well, while others barely get by, or not at all? The leaders and policymakers of cities will commission and then point to countless metrics in order to understand the relative health of a city, of a neighborhood, of a block: median home price and median income, percentages of the population on public assistance or incarcerated, statistics on who has or has not completed various levels of schooling, number of abandoned properties or parks per capita, number of reported incidents of violence or abuse. In referring to these metrics on a daily basis, we have given them control over the narrative we construct about our city, and that narrative is frequently one of violence, poverty, and trauma. It is the narrative of all the things we lack and all the ways we are broken. This quantitative data is useful, perhaps, in the way that symptoms can help a patient begin a conversation with her doctor about what ails her. In cities, with more sophisticated data and analysis, the symptoms may be interpreted in such a way that the stories they tell are nuanced and insightful. Yet, symptoms, as indicators of root causes, are often dislocated in time and space from their causal origins (as if any such moments could be identified at all). Symptoms, in the form of charts and graphs or even dynamic data visualizations, need to be contextualized with the stories told by those who live in between the data points, who live in the streets and on the blocks in relation to those next to them who tell stories as well. I believe that we must daylight the underlying structures of support in our communities and build bridges within these structures where the connections are failing or absent. For a city like Philadelphia and a neighborhood like Germantown, this means mapping, person by person and block by block, the individual networks of support along with the resources that exist within these networks. It requires identifying those who are resource-rich and creating links between them and those who are resource-poor, in effect creating a commons of generosity and exchange. 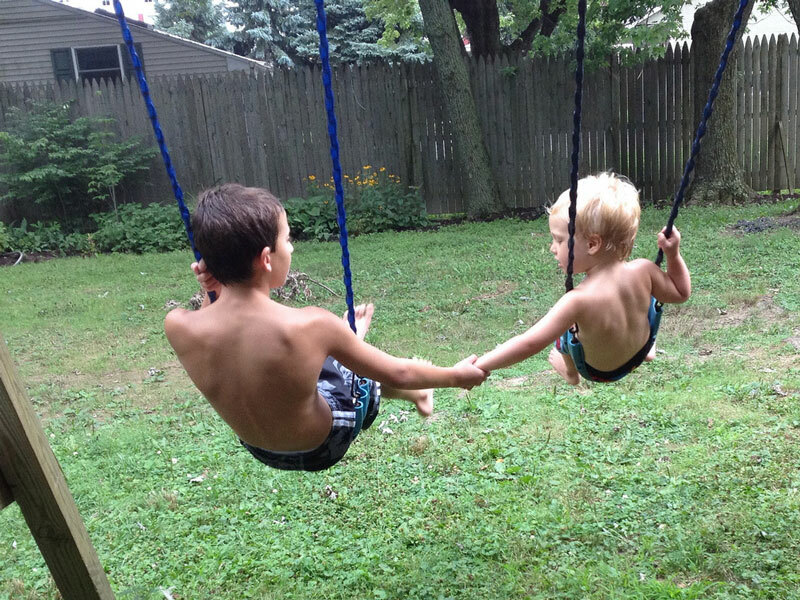 My partner and I are keenly aware of our reliance on those around us for support, and that we and our children would not have the life we live—and might not get by—without their generosity. Reciprocally, we try to be deliberate in how we support others, and how we model that for our kids. The way in which we build and sustain a network of support among our family, friends, neighbors, and fellow citizens radiates outward, emanating from the daily choices we make in our lives. Increasingly, I am striving to design an intentional life for myself and my family, one that acknowledges the interconnectedness of our every action with the world and that countermands the false apart-ness we are made to feel toward ourselves, each other, and our environment. The multitude of answers to the question of how we get by is of common interest to all of us. 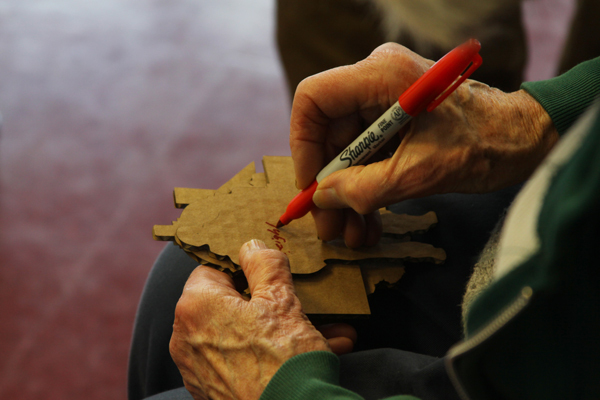 In sharing our individual support structures we take the first step toward building from the ground up a communal network of resources which leverages peer to peer, family to family, and neighborhood to neighborhood connections. 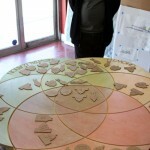 We’ll be developing a more locally-grown response to structures of support this summer as part of Germantown City Hall, a collaboration with Jacob Wick and Information Department for the 2013 Hidden City Festival. This entry was posted in Notes and tagged germantown, philadelphia, structures_of_support, urbanism on April 20, 2013 by Jeremy. We extend our warmest thanks to the small group of Germantown residents who willingly joined us in an experimental conversation using our project In a state far from equilibrium as a conversational tool. We learned so much from each distinct voice and have yet to really think about how we’d like to reflect the conversation back to the world. The highlight for me personally was experiencing an intergenerational conversation like this—open, honest, and challenging. I am thinking more about how we might bring generations together so we can all learn from the vast knowledge of those who have lived here for a lifetime. This entry was posted in Notes and tagged community, conversation, germantown, philadelphia, urban succession, urbanism on April 2, 2013 by Meredith. Support can be indirect. It doesn’t necessarily come from giving, but from opening up. It’s the difference between giving advice and listening. When we advise, we colonize. When we listen, we are simply with others. 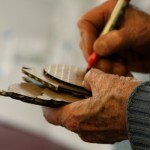 We allow them the space to process on their own or as a group, in a way that makes sense to them. It creates a space—an opening for agency, for engagement, for authenticity. I was reminded of this a few weeks ago while interviewing a good friend as part of our Structures of Support project (SoS). He is willing to engage very fully in conversation as long as the environment supports and welcomes it—as long as the space is open. In many ways, I think most people are eager for space to participate—if only we might learn how to make room for them. This weekend, Jeremy and I are hosting a conversation at Flying Kite where we hope to create space for a frank conversation about our neighborhood of Germantown. We’ll be using our project In a state far from equilibrium as a grounding object for the dialogue—asking participants to use the model of urban succession as a lens for thinking about our neighborhood. We’d like to explore how Germantown has changed over time and identify forces and assets in our community so we might better understand what is really at stake as this place shifts and transforms. We may speculate about what might come of the relationships that form through this work, or the projects it might spin off. But we really can’t know what, if anything, will come of it. We can only open the space and invite others in to share what they know. This entry was posted in Notes and tagged community, conversation, philadelphia, urban succession, urbanism on March 28, 2013 by Meredith.